There are number of ways to convert and save MS Office Word files as PDF document. However, majority of such conversion routines require additional software or plugin for actual conversion. Loop Apps online converter eliminates such restriction. It allows you to join multiple Office files and generate a single PDF document file online without need to install any software . 1. 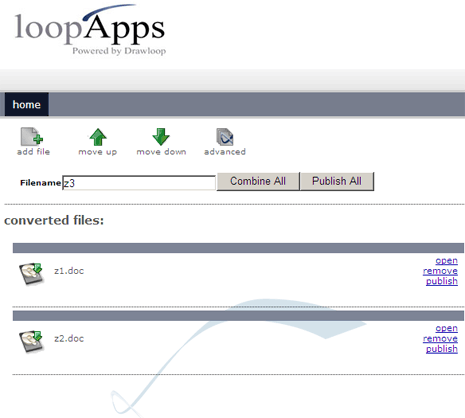 Open Loop Apps online converter website. 2. Click ‘Add File’ button to select files from your computer. You can select Microsoft Office Word, Excel and PowerPoint files. Say two MS Office Word files are selected. 3. You can order the position of selected files using ‘Move up’ and ‘Movie down’ buttons. 4. Enter the name for final PDF document file. Click ‘combine all’ button, this online app will merge selected Word files and provide you link to download PDF file with merged contents of selected Word files.